When the artist Piet Mondrian died in the winter of 1944 at the age of 71, he was in the midst of working on a painting he had told people would be the definitive expression of his aesthetic ideals. The work, entitled “Victory Boogie Woogie,” in homage to American jazz, had absorbed his entire focus for more than a year. In the last ten days of his life, while suffering from acute bronchitis, he worked on the painting to the exclusion of all else, tacking onto the canvas small squares of colored tape, ignoring his rapidly declining health. He worked until he collapsed. Friends discovered him passed out in his studio and rushed him to the hospital where, a few days later, he died of pneumonia. Art historians and critics have since called the diamond-shaped canvas covered in tiny pieces of colored tape that he’d left behind on the easel Mondrian’s last great, unfinished masterpiece. “Victory Boogie Woogie” was supposed to become the consummate expression of Mondrian’s aesthetic ideals. In mid-May 1942, he told his then-girlfriend, American artist and journalist Charmion von Wiegand, “Last night I dreamed a new composition.” He was in a state of excitement, she remembered in a 1961 article, and showed her a sketch of the work. That wonderfully evocative phrase, “Last Great Unfinished Masterpiece” brings to mind symphonies, cathedrals, and other projects of vast ambition that exceed the bounds of a single individual’s natural life: the splintered spires of Antoni Gaudí’s sandcastle-like Sagrada Família cathedral in Barcelona, only fifteen percent complete when its architect was killed in a trolley accident; Alban Berg’s 20th century operatic masterpiece, “Lulu,” whose third act wasn’t completed until fifty years after his death; Mozart dictating his final deathbed phrases of his “Requiem” to his rival, Salieri (courtesy the imagination of Milos Foreman). Such works, suddenly abandoned by their creators, are the cherished orphans of our cultural heritage. Once their maker has departed, they remain in aesthetic purgatory, on some undetermined spot in the infinite line between conception and achievement. They enchant us, at least in part, because around them we can still smell the lingering sulfuric burnt-match scent of creative sparks. The question of Mondrian’s unfinishedness lingers. How close was he to completion? Did he intend to wrap it all up neatly before he died, or was the unfinishedness intentional? 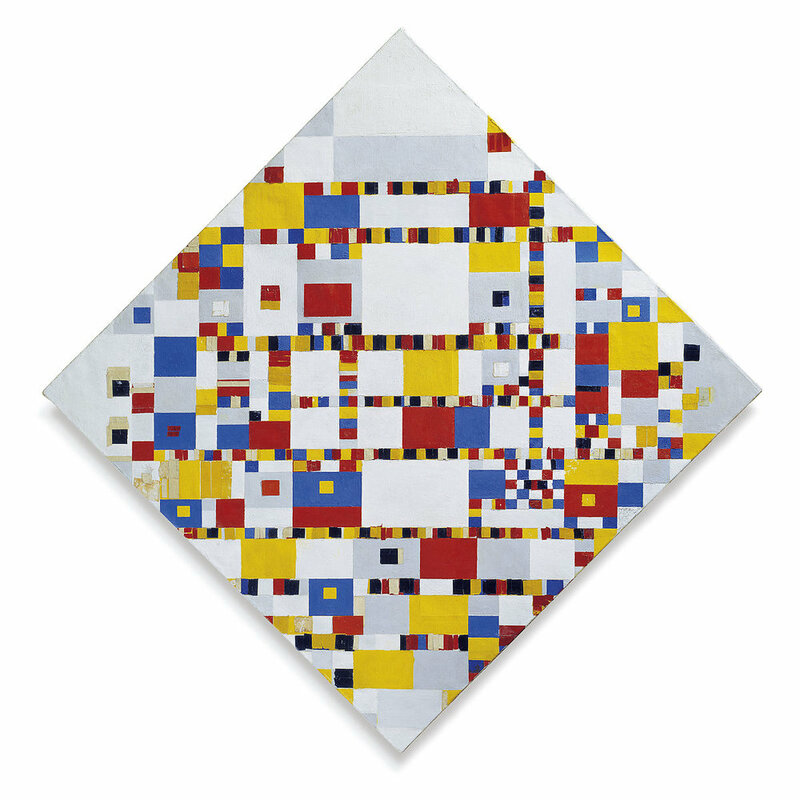 How unfinished was Mondrian’s “Victory Boogie Woogie”? After they returned from the hospital where he died, Mondrian’s friends looked at the painting on the artist’s easel and began to debate what to do. It was, in many ways, hard to tell where the artist stood with the work. The little bits of colored tape that Mondrian had tacked onto the canvas suggested to some that the painting was still very much under construction—based on the logical assumption that he would have ultimately wanted to remove the tape and paint the canvas with the color that he ultimately chose. Mondrian had been known to not only to tinker with his works, but rework them entirely, sometimes even after he had exhibited them as finished artworks. When he left Paris for London in 1938, in the face of advancing fascism, he took seventeen paintings with him, and continued to add and remove blocks of color, to alter lines. After barely surviving the Blitz in London—a 500-pound bomb dropped outside his studio door while he was inside—he boarded a boat to New York with a couple of crates of paintings, which he would later continue to rework as well. The art historians Harry Cooper and Ron Spronk named these the “Transatlantic paintings,” because they were created, in a sense, somewhere between Europe and America. In America, he discovered colored industrial adhesive tape, newly on the market at that time, which he could use to work out ideas on the canvas without using paint itself. Several of his New York paintings contain these little bits of colored tape. Two of Mondrian’s unfinished paintings from this transitional phase of his life, one from his Paris period, “Composition with Double Lines and Yellow” (1934) and another from the year after he arrived in New York, “New York City 2,” (1941) were included in the 2016 exhibition, “Unfinished: Thoughts Left Visible,” at the Met Breuer, the Madison Avenue outpost of the Metropolitan Museum of Art, which presented 195 works of non finito art from Titian to Marlene Dumas. But Mondrian was a pioneer in this post-war movement, to say the least—the war was not yet over—and who was to know if his tape jottings were intentionally endless, or part of a process that was meant to lead somewhere. Art historian Hans Jaffé called it “half-finished,” while art dealer Sidney Janis, who had seen earlier iterations, wrote that at the end, “Mondrian was tampering with a finished work.” Cooper, curator and current head of modern art at the National Gallery of Art, brazenly declared, “this painting was unfinishable” precisely because Mondrian had conceived of it as a “Last Painting” and therefore it was linked to the idea of his own mortality. At first, Mondrian’s final composition seems to be a self-limiting affair: a diamond shaped canvas with equal sides of 127 centimeters, divided into larger color fields and smaller blocks of color that come together as lines that transversely divide the canvas. Popping with blocks of color, one can imagine it as a kind of Rubik’s Cube (with no green or purple) that has come apart and spilled onto a tiled checkerboard kitchen floor. Did the order of colors really matter? How many possible ways could there be to organize it? Tremaine recognized the significance of the work and immediately loaned it to New York’s Museum of Modern Art (where it remained until 1965), but because all of those little pieces of loose tape made it “unstable,” in 1946 she asked three artists for advice on how to preserve it. Harry Holtzman, Mondrian’s dear friend and heir, said he would buy a new canvas and paint the work exactly as he thought Mondrian intended it to look—that is, finish it for him. Artist Carl Holty suggested removing all the tape and painting in the exact colors, or destroying the work to make it complete. A third artist, Perle Fine, suggested leaving the original painting intact, while painting an exact copy, without projecting any new intentions onto it. Tremaine decided on Fine’s plan, and let her create the copy, which is still used as template for restorers whenever a piece of tape falls off or something needs to be fixed. They did not, thankfully, dismantle Mondrian’s composition, and it remains intact today at the Gemeentemuseum in its unfinished state, prompting others to guess, conjecture, and speculate. There’s a photograph from 1941, taken by Arnold Newman in the New York studio where Mondrian spent the last four years of his life. In it, Mondrian is wearing a suit that could easily be mistaken for a scientist’s lab coat. He’s sitting perfectly erect, with his hand underneath his chin, a look on his face of profound melancholia. His almost-bald pate forms a perfect oval, the shape of which is accentuated by a dark canvas mounted on the wall behind him, so together they make the half radius of a circle, part in light, part in darkness. The ruminative eyes and geometric shapes are sculptural and reminiscent of Modigliani’s self-portraits: a cursory almond shape for an eye or a loose trapezium a nose. Who was this man who tried to make everything around him align? “People think of him as a dry calculator,” Janssen told me. Because Mondrian seeks a pure abstraction via colors and the lines and the graphic elements, there is an implied anonymity to his paintings that doesn’t encourage us to ask questions about Mondrian, the man who made them. At least, we don’t do this automatically, the way that we do when we look at a van Gogh or a Rembrandt, and we feel that through the image we are making a connection with another human being. Many of his contemporaries viewed his work as somehow algorithmically decipherable. Georges Vantongerloo, a Belgian painter and sculptor who was also a founding member of the De Stijl movement, in 1922 and 1923 took measurements of Mondrian’s paintings and made equations based on certain calculations, ultimately producing hundreds of pages of data to explain or describe how the images came to be. He presented these to Mondrian, who was apparently quite angry to see his work reduced to formulas, but who remained friends with Vantongerloo nonetheless. To this day, people call Janssen and ask him to supply them with the RAL Code for Mondrian’s paintings, so they can use those colors to reproduce his art. The RAL Code is a color code for standard varnishes, powder coatings and plastics used in industry, architecture and road safety, so the very question presumes that Mondrian’s colors come from an industrial stock kit, which is, of course, not the case. Janssen points out that although Mondrian limited his palette to red, blue, yellow, black and white, as per the De Stijl manifesto, he was still a painter who worked with oils on canvas, and who was fascinated with the texture of paint, color values, and especially the impact of light on pigments on the canvas. He limited his palette in order to explore the range of possibilities within these limitations—and even within the primary color palette, the hues became increasingly differentiated, especially when he added the industrial tapes to the mix. Even in those compositions that are limited to black, white and grey, there are many shades of gray. In 1998, the Stichting Nationaal Fonds Kunstbezit purchased “Victory Boogie Woogie” for the Gemeentemuseum from American collector S.I. Newhouse for eighty million guilders (approximately thirty-five million euros, or about forty million dollars), arousing tremendous controversy. Not only was the sum far higher than the government had ever spent on a single work of art at the time, there were also a lot of questions about whether those funds wouldn’t be better spent on a Rembrandt or a van Gogh, painters who were far more accessible to the general public. And why spend so much money on an unfinished painting? The Gemeentemuseum wanted to answer the public’s questions about the painting but there was still much they didn’t understand about the artwork, or Mondrian’s artistic process. Hans Janssen felt that the painting represented an incredible resource that could be employed towards that end. In 2006, the museum began what would be a seven-year investigation of the work, in collaboration with the Netherlands Institute for Cultural Heritage and a research team from Italy, called MOLAB. They argued that the small pieces of tape that Mondrian put onto the work as he was revising it indicated a process of “thinking on the canvas,” and some people thought this could be the key to cracking the Mondrian Code. Employing a host of then-new penetrating visualization techniques such as infrared color reflectography, ultraviolet fluorescence imagery, and x-radiographs, along with something called “Fourier Transform Infrared Spectroscopy”—the types of analytical tools typically used to examine medieval frescoes and Old Master paintings—they tried to “excavate” the layers of tape, which were as many as eight layers deep in some cases. After they’d come to some technical conclusions about the work in 2012, and published a book about it. Mondrian’s last great painting, “Victory Boogie Woogie,” seems to have been undergoing a similar process as Mondrian’s health was deteriorating—he was tearing apart the neat, classical coherence of his earlier work, and fracturing the lines, breaking the colors into ever-smaller pieces, disorganizing the orderly. His insistent effort to throw the composition out of balance and off the line, to add dynamism and restlessness, could be seen as a way of coming to terms with his own mortality. The efforts made the painting about unfinishedness as much as it was about life. Without the changes Mondrian made feverishly in his final days, “Victory” would certainly not retain the kind of visual vibration that it still manages to have now. Ultimately, what’s vital to the painting is that it’s unfinishable: “Victory” contains a human element of inexactitude and resistance to finalization, that keeps those of us who are also in search of conclusions constantly rebuffed, and thus, continually fascinated. Nina Siegal is a journalist and novelist from New York, who has been based in Amsterdam, the Netherlands, for the last decade. She is a regular contributor to The New York Times, and specializes in writing about Dutch Golden Age masters, art attribution issues, European museums, and art crimes.